Flag holder kits mount to the back of the Slingshot behind the headrests. 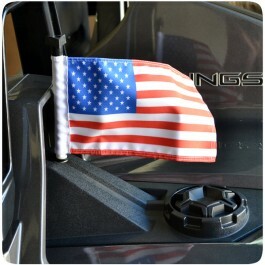 Drivers are able to mount standard 6”x9” motorcycle flags that they can either order along with the flag holder or pick out themselves. Flag holders give the Slingshot a boost in personality and let drivers advertise their beliefs, ideals, or interests.